If you have just welcomed a new feline into your family, then the Savic Iriz Starter Kit – 42cm is another neceΒary addition for your home. 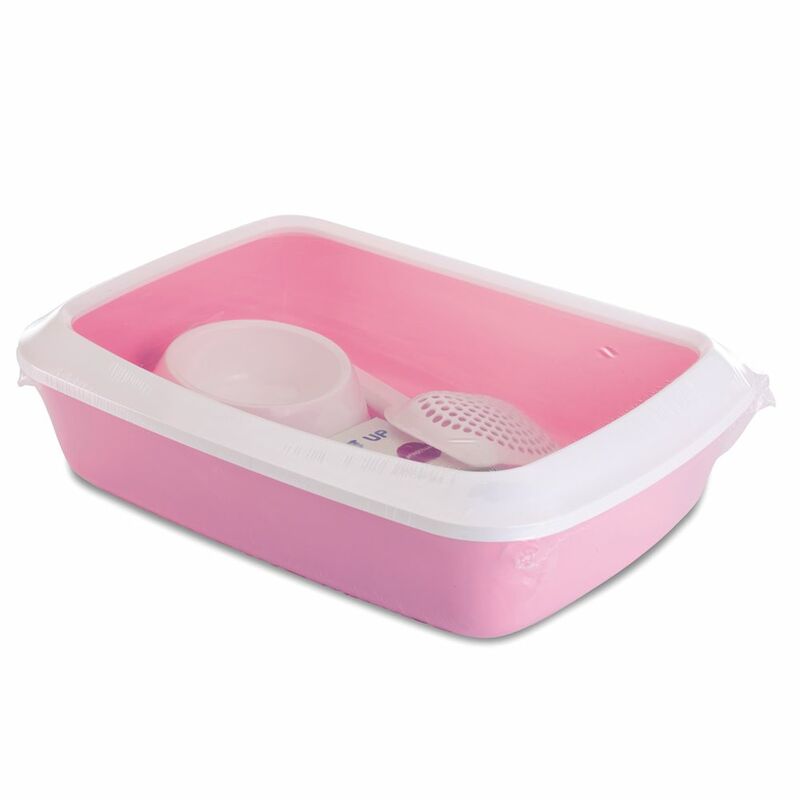 This litter tray with raised edge is ideal for helping to toilet train young kittens. The strong edge helps to ensure that cat litter does not fall out onto the floor, even if your cat is prone to digging or scraping. In spite of the low entrance height into this cat litter tray, the area around your cat's toilet will remain clean and hygienic. The edge can also be removed to make it easier to clean. The Savic Iriz Starter Kit includes a litter tray, scoop, feeding bowl and a pack of 12 Bag it Up Litter Tray Bags – the perfect start for your little cat! Savic Iriz Starter Kit – 42cm at a glance: Starter Kit for cats Included in delivery: 2 x litter tray with edge 1 x litter scoop: 25. 5 x 11 cm (L x W) 1 x food and drink bowl with handle: diameter 15.5 x (H) 5cm, capacity: 300ml, upper edge diameter 11.5cm 12 x Bag it Up Litter Tray Bags (size: medium) Stable edge: for a clean toilet environment High quality craftsmanship Available in two colours: baby blue, baby pink Dimensions: Outer dimensions: 42 x 31 x 12. 5 cm (L x W x H) Inner dimensions: 38 x 28 x 9.5 cm (L x W x H) Tray: 10cm (H) Entrance with edge: 12.5cm (H) Savic Bag it Up Litter Tray Bags are an ideal addition to any cat litter tray. These tear resistant, transparent films inserts help to prevent urine residue building up in your cat's litter tray, meaning that your cat's litter tray can be used for longer. They also help to prevent unpleasant smells and making cleaning your cat's litter tray a simple task.